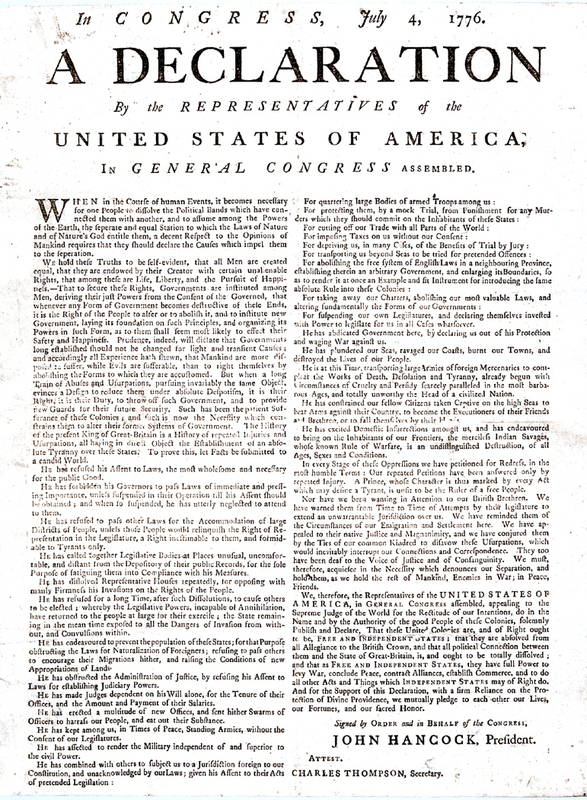 Perhaps the most peculiar thing about the Declaration of Independence is that the portion of it that seemed commonplace when it was written now seems revolutionary, and the part that seemed to its framers as most central, to us seems trivial, even whiny. As a piece of rhetoric, it begins in generalities, narrows to specifics, and ends in a course of action. It couldn’t be more concisely structured. The committee charged with drafting it in the summer of 1776 chose wisely when it asked Thomas Jefferson to write the first version. Jefferson’s prose is a model of late 18th-century style: precise, lucid and syllogistic. It states baldly and without argument or support, that all men are born equal, have certain rights by virtue solely of being born, and that when a government fails egregiously to effect the safety and happiness of the people, it is their right to replace it. “He has plundered our seas, ravaged our coasts, burnt our towns and destroyed the lives of our people,” it says. Pure hyperbole. These complaints were the part of the Declaration that was “news” in 1776. They constituted what made the document inflammatory. Few can read through the whole of the Declaration of Independence now without a sense of fatigue: Those complaints were the issues of 1776, not of today. It is the second paragraph that seems told to all people at all times, and remains news to us in the 21st century. But to follow those ideas from the century before the Declaration into the ink on its page shows just how important its year of birth was. It was born in the cusp between two great ages, two overriding sensibilities, and partakes of both. The period from about 1775 to about 1825 is one of the richest in humankind’s history, fertile, even febrile. It is in many ways, the hinge between the past and the modern, between the classically minded 18th century and the Romantic 19th. From an age of Reason to one of Sentiment — as it was called at the time. In Europe, it was the age of Goethe and Rousseau. And no figure in the American experiment better demonstrates that shift of sensibilities than Jefferson. On one hand, he epitomized the faith in science and logic of the Enlightenment; on the other, he shared with the revolutionary Rousseau the belief in the nobility of humanity and its drive to social improvement. You can hardly fail to notice this point when you visit Jefferson’s home in Virginia. Monticello is a mirror of its maker. Jefferson built a model of Palladian proportion and filled it with moose antlers. The outside lines of the house are clean and mathematically rational. The inside is a warren of peculiar and unnerving spaces. Jefferson never fully reconciled these two aspects of his personality. He was a slave owner who sings of the dignity of the free man. How much more conflicted than that can you be? The Declaration of Independence speaks to us now, in large part, because of this clash of sensibilities in Jefferson. On the one hand, you have the ideas of the Enlightenment, that brilliant flame of philosophy and science that sprang up in Europe in the 17th and 18th centuries. On the other hand, you have the growth of the individual as a thinking and feeling person. The Enlightenment preached rationality and temperance, tolerance and universal principals. It was an idea that took hold and flourished. When you compare that with what Jefferson first wrote, you can see how much better a writer Jefferson was. He only needed 31 words to say what Mason required 57 for, and say it more forcefully and memorably. By 18th-century reasoning, self-evidence was universal, while sacredness could be construed as sectarian. Franklin wanted to emphasize the universal truth of the proposition. And Jefferson himself changed “property” to “happiness,” and with that stroke made the Declaration jump from the past into the future. The past was Thomas Hobbes, with his sense of the nastiness, brutishness and shortness of life, and a belief that the natural order of mankind was greed, rapine and thievery. Only strong central government, he wrote, could possibly control the natural impulses of humankind. The middle was Jefferson, perfectly if perilously balanced between. The right of life remained pretty much the same looking forward and back, but the other two rights changed meaning over the cusp of 1800. Locke believed that all humans coveted was property; Jefferson realized that there were many routes besides ownership to humanity’s true goal, individual happiness. Hence, the change in language. Liberty is the word that has changed the most. In the 18th century, it meant being left alone, basically. Your government let you be: Taxes shouldn’t be too onerous and armies shouldn’t be quartered in your home at the whim of the commandant. But by the 19th century, liberty took on a more revolutionary turn: Romantic writers saw liberty as the antidote to repressive regimes around the world and one read poems to Count Egmont, the Prisoner of Chillon and Nat Turner. It fueled popular movements all across Europe and led to a crisis year in 1848. Liberty meant revolt — a very different thing from what John Locke had in mind. This meant that the Declaration could speak, Janus-like, forward and backward. The fulcrum of modern history. The Age of Reason is emerging from its pupa into the language of Romanticism.